Objective: Identify general tips to prevent and treat spider bites. Review the information below on spiders, bites, and how to prevent bites. Ask workers to identify symptoms of spider bites. Ask workers to identify areas where they find spiders. Many people are afraid of spiders, but the majority of spiders are harmless to humans. In fact, most spiders are beneficial predators that reduce pest populations such as flies, crickets, and mites in and around yards, gardens, and crops. Spiders normally will not attempt to bite unless accidentally trapped against the skin or grasped. However, some actively guard their egg sacs or young. Most spiders prefer warmer climates and dark, dry places where flies are plentiful. Only a few spiders like the black widow spider and the brown recluse are dangerous to workers. The black widow is known for the red hourglass marking on its underside. Black widow spider webs are usually built in woodpiles, rubble piles, under stones, in hollow stumps, and in rodent burrows. Brown recluse spiders are very secretive. They can often be found under rocks, in crevices, or inside boxes or containers. 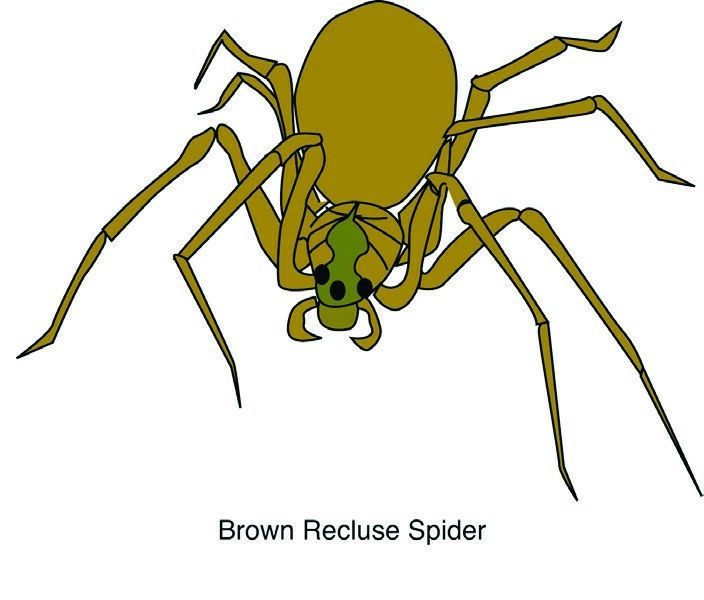 Brown recluses are brown in color. They have three pairs of eyes, one pair in the middle and another pair toward each side of their head. They may have a pattern like a violin on their underside — but not always. Painless bite, not even noticed. Slight feeling, like a pinprick, when bitten. Slight swelling at the site. Sharp, stinging sensation when bitten. Significant swelling at the site. Swelling of the lips or throat. These serious symptoms call for medical attention—fast. 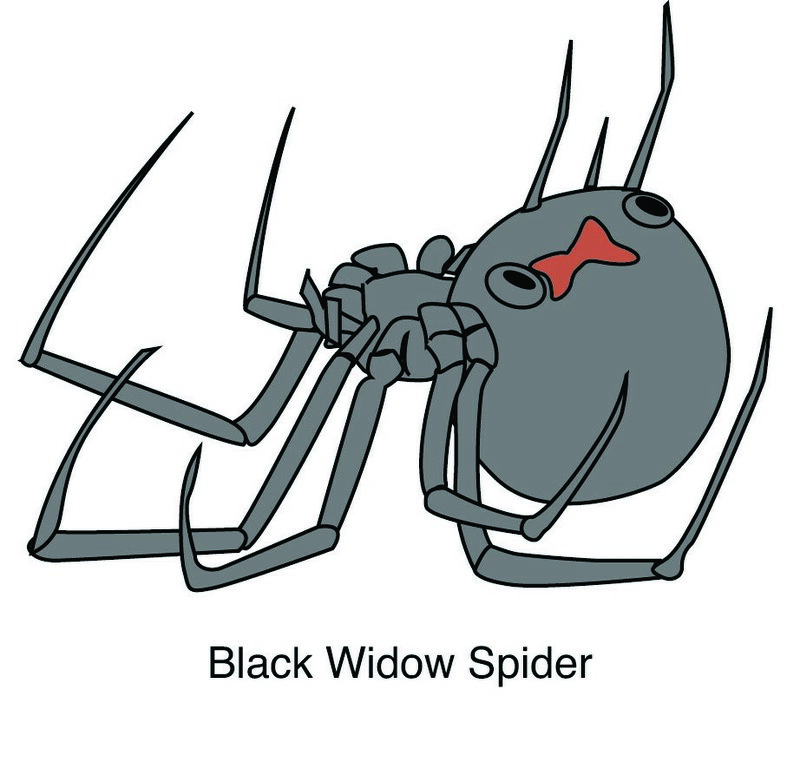 They may indicate a black widow or brown recluse bite, or they may indicate that the worker is allergic to spider bites in general. A cloth dampened with cold water or filled with ice may be applied to the bite while awaiting help. Check before working near vines, brush, overgrown grass, and wooded habitats. Wear gloves when handling firewood, lumber, and rocks. Install yellow or sodium vapor light bulbs outdoors since these attract fewer insects for spiders to feed upon. Do not stack wood against a building. Remove heavy vegetation and leaf litter around building foundations. Black widow spider webs are usually built in woodpiles, rubble piles, under stones, in hollow stumps, and in rodent burrows.